What turns candid photographs, like those of Grey Villet's assembled here, into art? Most important perhaps, is that they strike some chord that resonates, drawing the viewer emotionally into a moment from real life. 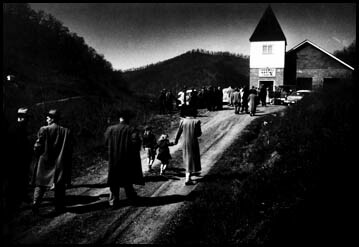 The sombre, almost surreal image of people walking toward a simple church evokes a sense of sorrow--and indeed it depicts mourners on their way to a funeral service following the drowning deaths of 26 children from a tiny Kentucky town called Cow Creek in a 1956 school bus accident. Grey had arrived on the scene even before the bus was grappled from the river. Over the next few days, using his long lenses to avoid intruding on the private pain of the village, he quietly recorded its humble rituals of mourning. The "take" which had become a mini essay on grief arrived in New York late on the night when Life's final pages were already going to press. Barbara Cummiskey (who would become Grey Villet's second wife) was the story's advocate in layout sessions. Though she struggled to get it enough space, it did not run as she hoped. Nonetheless, she recognized that both in their timeless compassion and subtle composition, Villet's images had lifted photojournalism into a timeless art* that had touched her heart. *As seen above left, the shadowed surroundings framed by sunlight on a country road and church facade draw the eye into the scene as if the viewer had joined the grieving mourners by walking just behind them. Top left: 1956 Cow Creek Kentucky -sombre, silent and sad--mourners arrive at a church near Cow Creek Kentucky where 26 children drowned in a school bus accident. Top right: Oren Lee Staley, 1955 president of the National Farmers Association works the phones in Kansas. 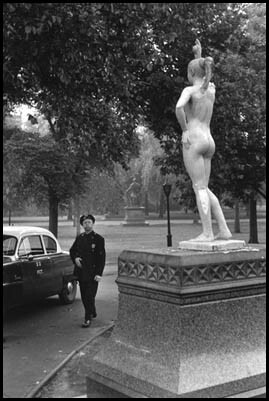 Above: NYC 1955 a plaster replica of a belly dancer where it shouldn't be stopped a patrolman in Central Park in his tracks. In the picture at the right, Oren Lee Staley, president of the National Farmers Association is recruiting members for an organization meant to function as a quasi union and political force. But the quiet composition of this seemingly artless image turns the man talking on the telephone next to an upright piano in some long ago Kansas farm parlor into a kind of lonely 'everyman,' a seeker frozen forever in time and place. And what of the picture of a New York City cop coming upon the unexpected plaster replica of a belly dancer illegally placed atop a Central Park plinth as a publicity stunt? Does it rank as art because the cop's surprised expression brings a smile and lifts our spirits? That is surely why we react to it, but once again, the eye is drawn into the action by subtle framing of the subject matter. Above: In 1957 a tornado ripped throuogh Kansas leaving a wide swath of devastation but sparing a little girl, her kitten, and her brother. 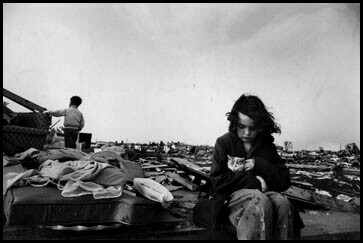 In the news image above, a child's tender concern for her kitten is mixed and balanced with her brother's curiosity about a couch in the aftermath of a tornado. The shot is testament to Grey Villet’s ability to instantly compose and fix an evocative moment in time, --an omnipresent mark of his genius which spoke from silence to enhance our awareness of life.